Grinding just before brewing will protect the aroma of your coffee. Ground coffee interacts with the air around it and, within hours, loses a great deal of flavor and aroma. The longer the ground coffee sits around, the less aroma you will find in your cup later. Only grind what you need now. Don’t grind for the whole week! Once the beans are out of an airtight packaging, keep them in a dry, dark container with a tight closing lid. Capresso offers grinders in all three categories. Conical Burr Grinders preserve the most aroma and can grind very fine and very consistent. The intricate design of the steel burrs allow a high gear reduction to slow down the grinding speed. The slower the speed the less heat is imparted to the ground coffee thus preserving maximum amount of aroma. Because of the wide range of grind settings these grinders are ideal for all kinds of coffee equipment, Espresso, Drip, Percolators, French Press. The better Conical Burr Grinders can also grind extra fine for the preparation of Turkish coffee. Grinding speed is generally below 500 rpm. Burr Grinders with disk type burrs grind at a considerable faster speed than conical burr grinders and create a bit more warmth in the coffee (10,000 to 20,000 rpm). They are the most economical way of getting a consistent grind in a wide range of applications. They are ideal for Drip, Percolators, French Press and well suited for most pump espresso machines. However they do not grind as fine as Conical Burr Grinders. 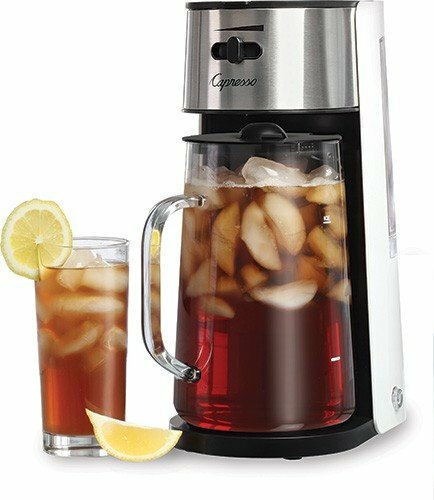 Blade Grinders are suitable for drip coffee makers and percolators. They also do a great job for grinding spices and herbs. The blade rotates at very high speed (20,000 to 30,000 rpm) thus creating a bit warmer coffee and a bit of “coffee dust.” That coffee dust can clog up the fine mesh of the metal baskets used in pump espresso machines. When coffee is freshly ground and freshly brewed many people can tell the difference in taste from burr-ground and blade-ground coffee. What else to look for in grinders? Static, noise, safety and ease of cleaning are important factors. Grinding creates “static cling”. The ground coffee particles fly around and “cling” to surfaces. Before removing the grounds containers (all burr grinders), tap the container slightly and remove slowly. Before removing the lid of blade grinders, tap the top of the grinder and remove the lid slowly. Some grinders are extremely loud which can be very annoying. The Capresso Conical Burr Grinders (Infinity) and the Capresso Blade Grinders (Cool Grind) are among the least noisy in its class. 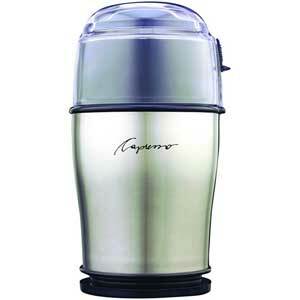 The Capresso Stainless Steel Burr Grinder / Black Burr Grinder has a specially insulated lid. It is the least noisy grinder in its class. Blade grinders cannot operate without the lid in place. In addition, the Capresso Cool Grind series has the fastest blade stopping action of any blade grinder on the market. The Capresso Stainless Steel Burr Grinder will not grind without the lid in place. The Capresso Conical Burr Grinders will not grind if the bean container is missing or not “locked” in place. All Capresso Burr and Conical Burr Grinders come with a cleaning brush and have removable upper burrs for easy cleaning of the grinding chamber.